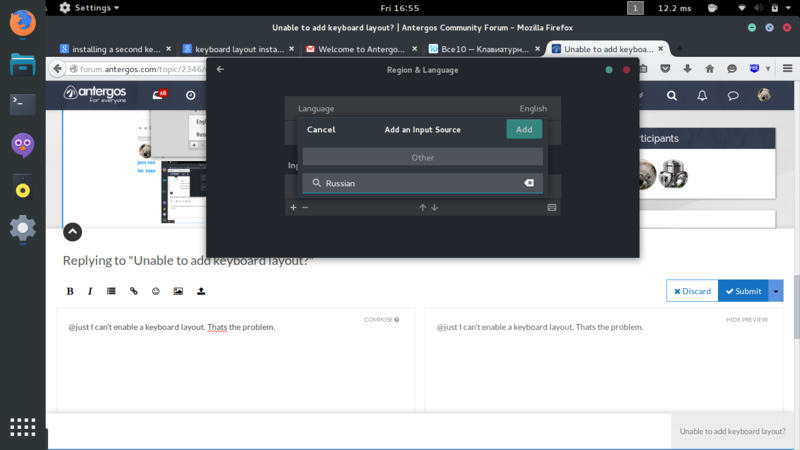 Unable to add keyboard layout? 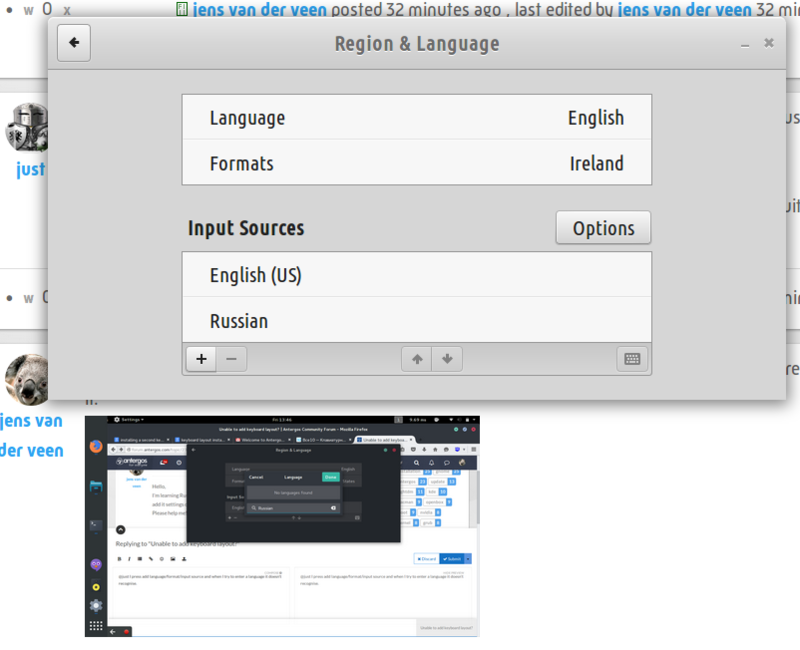 @jens-van-der-veen To what DE are you trying to add Russian? @jens-van-der-veen Этот текст написан по-русски в Гноме 3.16 (= This text is written in Russian in Gnome 3.16). So there should be no issues with adding it. Could you please be a bit more specific, describing the problem(s) you encounter? The OP is quite generic. @just I press add language/format/input source and when I try to enter a language it doesn’t recognise it. If the language is not listed in Region & Language --> Formats (Russian in your case), it may be a problem to add it from GUI. As you can see, I’m using Ireland formats. But can you at least add Russian as an Input Source (keyboard)? It is needed if you want to write in Russian. To be able to read Russian text, some fonts with cyrillic characters must be installed. @mrjenskay Anyway, there’s not a problem at all to enable / add any locale you want to Gnome’s GUI - with some commands in terminal. If you aren’t afraid of using it, we can do it in 2 minutes. @just I can’t enable a keyboard layout. Thats the problem. First of all, we need to enable in Arch (Gnome in your case) some additional locale(s). All work is done in terminal. We will issue two simple commands and will use the nano text editor. Let’s go. In the terminal, issue the command sudo nano /etc/locale.gen. After you’ve entered your password, the nano editor will open, with /etc/locale.gen text file within it. You’ll see a very long list of locales (lines), known in Arch. Almost all of them start with the hash character # in the 1st position - the lines are commented out (ignored). We’re interested only in locales that have UTF-8 qualifier. Ignore all others. For safety, use only Up/Down-Arrow keys to scroll the text. As you’re interested mainly in Russian, scroll down until you see the line that reads #ru_RU.UTF-8 UTF-8. Uncomment it, by deleting the initial # character. 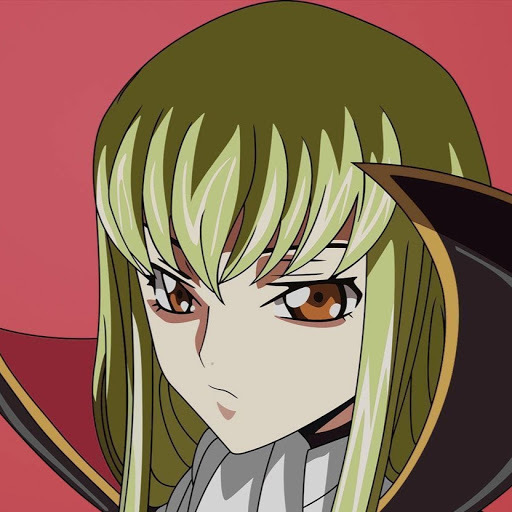 The line should read ru_RU.UTF-8 UTF-8 now. If it is commented out, uncomment the en_US.UTF-8 UTF-8 locale as well. It’s wise to have English (US) locale explicitely enabled. If you was installing Gnome with your national locale, different from English (US), it should be already uncommented. Check it. Uncomment any other locale(s) you wish to see in Gnome’s GUI. Now we must exit from nano, saving all the changes. We’re back in terminal at the bash prompt. Exit from terminal (close it) by hitting Ctrl+D. No reboot, no logout-login are needed. 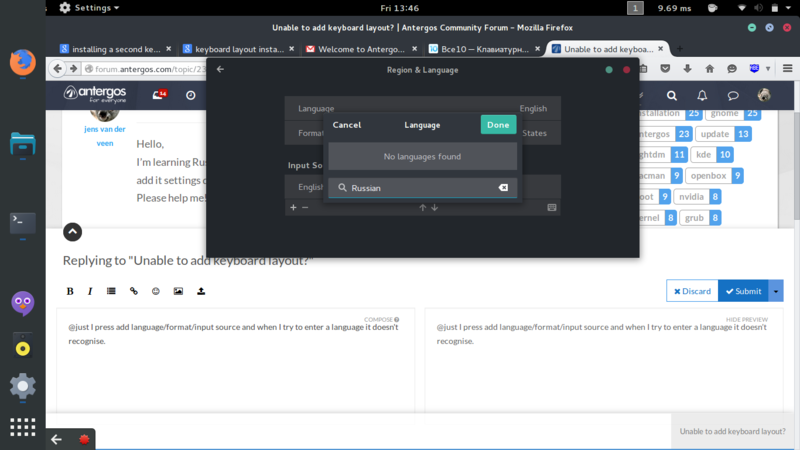 Simply open Gnome’s Settings. In Region & Language you should see all enabled locales now. This was the first step - enabling additional locales. If you still don’t see Russian keyboard, or don’t have Russian fonts, we’ll add them later.